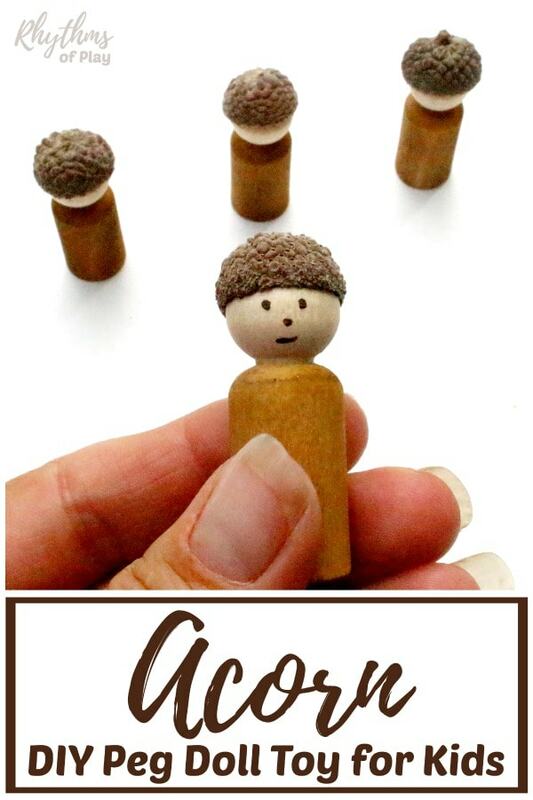 These cute little acorn peg dolls are an easy DIY toy for kids. This acorn craft is made with acorn caps and wooden peg dolls. Children love making this peg doll craft to use for pretend or imaginative dramatic play. DIY acorn peg dolls are a unique DIY wooden toy and homemade gift idea for children. 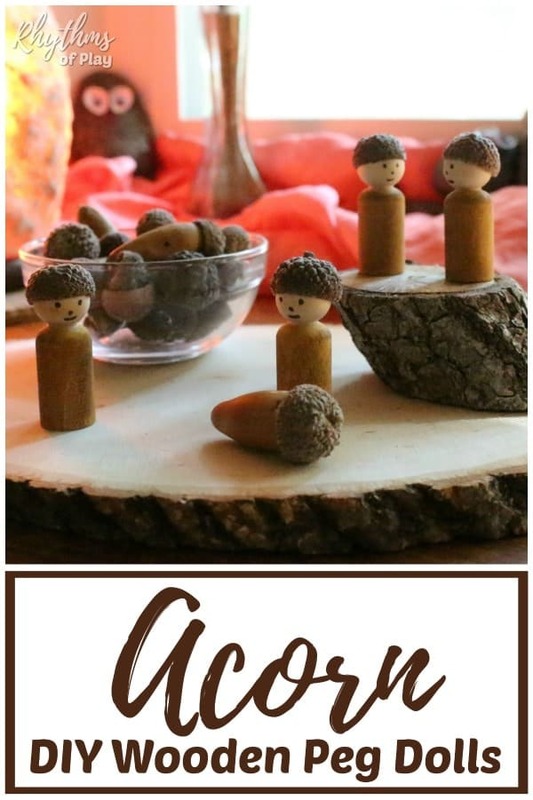 DIY Acorn Peg Dolls are an easy acorn craft and homemade gift idea for kids! They are the perfect handmade toy dolls for pretend or imaginative dramatic play. These cute little peg dolls also make fun rustic DIY autumn home decor that can be displayed on mantles, window sills, fairy gardens, and fall nature tables. Acorn caps – Go on a nature hunt for acorn caps or click the affiliate link to purchase. Wooden peg dolls – This package contains more wooden peg dolls than you will need. You can find more peg doll crafts listed at the bottom of this post. 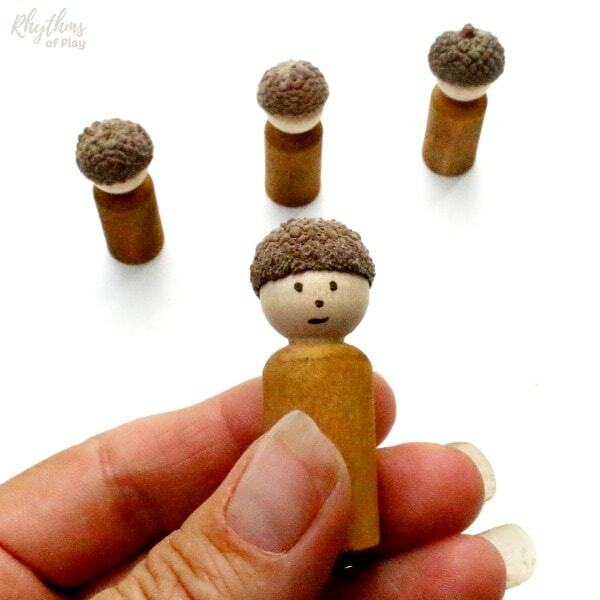 There are a few ways to paint the wooden peg doll bodies to make them into acorn peg dolls. Originally I used watercolor paint straight out of the tube to paint these. I layered the watercolors by painting on the yellow ochre first followed by raw umber when the paint was still wet. Another super easy option is to use brown liquid watercolor paint . Use a paintbrush, or fill a 4 oz canning jar with brown liquid watercolor paint and dip the bodies of the wooden peg dolls into the liquid watercolor solution to paint them! Do not paint the heads. Allow wooden peg dolls to dry. Next, place a drop of glue inside each acorn cap and then quickly put the acorn cap onto the wooden peg doll. Press the acorn cap into position on top of the wooden peg dolls head. Use a paint pen or dip an incredible nib into the paint color of your choice to dot on a simple face. For more detailed instructions check out the tutorial in DIY Rainbow Peg Dolls. DIY acorn peg dolls are a fun acorn craft and gift idea for kids. Children can use this handmade toy for pretend or imaginative dramatic play. 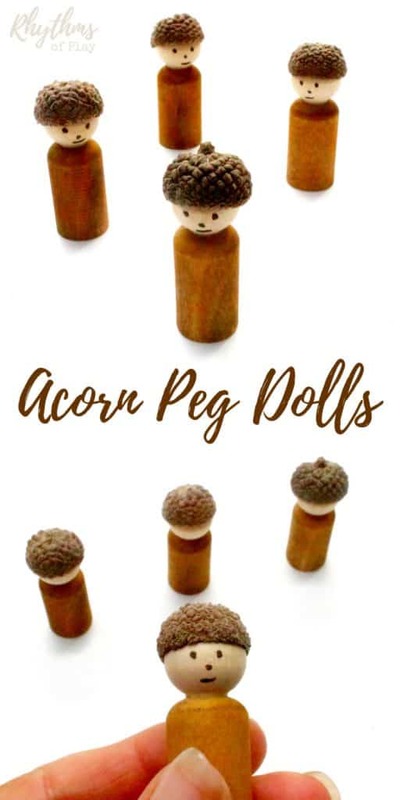 Acorn peg dolls also make unique DIY home decor. These cute little acorn people look super cute displayed on mantles, window sills, nature tables and in fairy gardens. For more amazing fall nature crafts see Top 10 Fall Nature Crafts. If you purchase this set of wooden peg dolls to make this acorn craft, you will have enough left to make a few more of these wooden DIY toy ideas for kids!